Before Yelp, Gowalla and Foursquare and other location-aware social recommendation/discovery sites became popular on smartphones, there was Brightkite. It was among the earlier apps of this kind which I’ve tried using on my iPhone. Today Brightkite just released two new apps for two mobile platforms, Brightkite for Nokia and Parafoil for Palm. The Brightkite app for Nokia runs on all Symbian S60 5th edition phones such as the N97 and Nokia 5800 XpressMusic. It is currently available for download at the Nokia Ovi Store. Meanwhile, the Palm application is called Parafoil and was built using the Brightkite API. The app works with Palm Pre and Palm Pixie phones. You can download this third-party app from the Palm App Catalog. 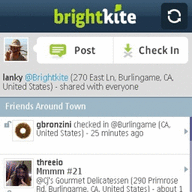 By releasing these two apps, Brightkite is extending its reach beyond the U.S. market. since Nokia phones are very popular in the international market. In fact, Japan is one of the many countries which showed strong growth in the usage of Brightkite during the previous months. In case you have not used Brightkite before, this app lets you meet people around you, keep up with your friends, explore and discover new places. On the other hand, Parafoil lets you share your location, send photos, post to Twitter and Facebook all from one place. You may download Brightkite for Nokia app here, and Parafoil here. The app is also available for the BlackBerry, iPhone and Android devices.